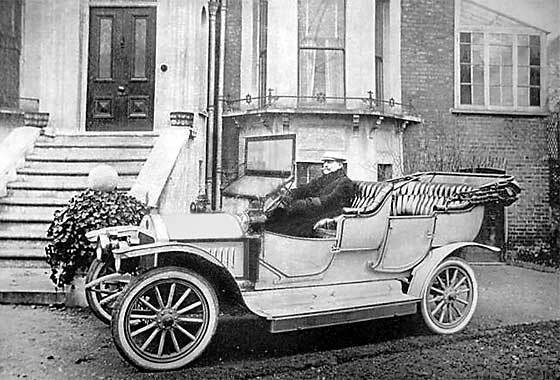 Photo received from Gary Vickers, Lincoln (UK) asking if it was a car by Richardson of Saxilby, Lincoln. This picture has taken months to identify and did the rounds of all our experts. It was then put on the brilliant www.PreWarCar.com site, with no firm identification, and was then published in the 'bible', The Automobile mag. At this point our Bryan Goodman saw it and identified it as a early Argyll. The distinguishing features seem to be the plated louvres & rear slung handbrake handle. Another of a series of photos received from Maggi Wilson (USA). This one is registered CP 8 which is a Halifax Registration. Our Tim Harding confirmed the car is a 1903 De Dion Bouton 8HP Tonneau and he had information that CP8 was registered to a Donald Sayer of Halifax. 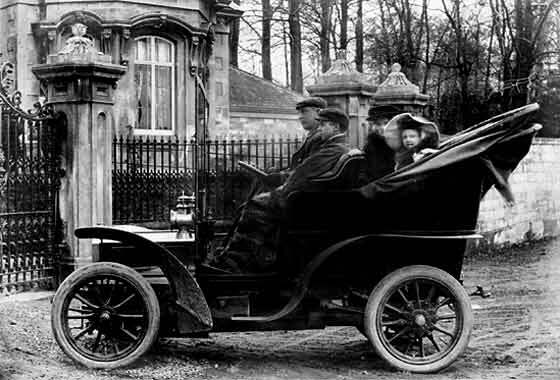 As registrations began in 1904, cars already on the road were registered at end of 1903, this one on 28th December 1903. First period photo shows it at Kirkstone Pass in the Lake District and the second very much later. This photo received from David Shearer (UK) is another that has taken some time to identify. Airbrushing out the top of front mudguard suggested a tall header tank, a Peugeot? What is confusing is that the rear mudguards have the enlarged hump of a chain driven car, but there are no chains or sprockets evident. Our Bryan Goodman advised it is indeed a cca 1904 Peugeot. It seems that in the 1903 - 1904 period models were available with either type of drive, so same mudguards. Photo received from John Stubbs from Bramley Village, Hants (UK) who some thirty years ago spoke to a lady who worked at the local post office before the war, and had collected some of the postcards of the village. He copied them by taking 35mm photographs so the definition has suffered. From another photo the registration appears to be LS 95. This was issued by Selkirk County Council (southern Scotland, no dating info remains). The car is also from Scotland, being a cca 1905 Argyll. One of a series of photos received from Maggi Wilson (USA) whose family owned an apartment complex in the USA and the photos belonged to a tenant who died without any family. All cars have British registrations. All seem to have 'C' which were issued by Yorkshire County Council, records now lost. 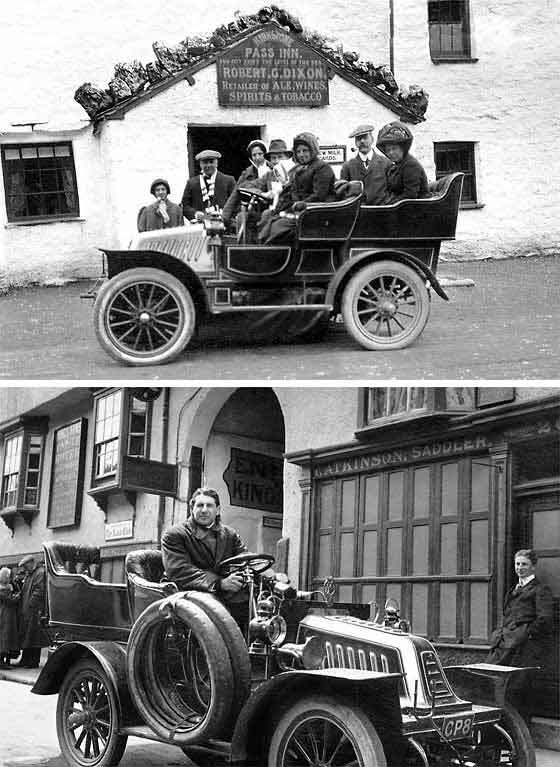 The car on the left is the most interesting, identified by our Tim Harding as being a cca 1907 Horbick, poss a 10/12. These were made by Horsfall & Bickham of Manchester. The two other cars from the same photo as above received from Maggi Wilson (USA). Left is the Horbick, middle is a Humber (further details in the item lower down). 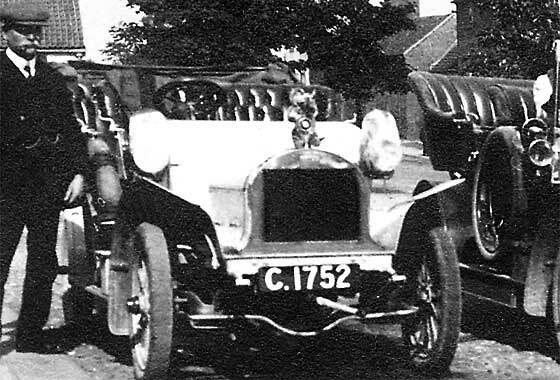 The car on right is also relatively unusual being a cca 1907 Charron. CGV cars were made in France by Charron, Girardot et Voigt and sold as CGV until 1907 and as Charrons thereafter to 1930. Quite a few chassis were exported to Britain and full cars were also eventually made in Britain. CGV Charron also made first armored cars. The Humber in the middle of the photo received from Maggi Wilson (USA), was confirmed by our Tim Harding as being a cca 1907/08 'Coventry' Humber 15 HP. This differentiates it from being a 'Beeston' Humber. It is unfortunate that the West Riding Yorkshire registration data is no longer available as this would help to date the car more accurately. It is quite probable however that the photos were taken some years later because the fashions appear to be lot more modern. Photo from Alan Griffin of Leamington Spa (UK) who is a local historian and who recently purchased some early photographic postcards which he wishes to use in a forthcoming book. The cards show a rather eccentric local vet named Eusebius Gustavus Crowhurst; one of him in his newly acquired motor car. He would very much like to identify the make of this car if possible. We can confirm that it is a 1910 Humber 12 Doctor's Landaulette. For more pics and info on EGC, click on the photo. Lovely photo received from Nigel Giles in Devon (UK) of his wife's great grandfather John Frank Eaton (driving), great great grandfather John Eaton, and standing, her grandfather Frank Herbert Eaton. They were mining engineers that 'sunk' a number of coal mines in Yorkshire and the North. 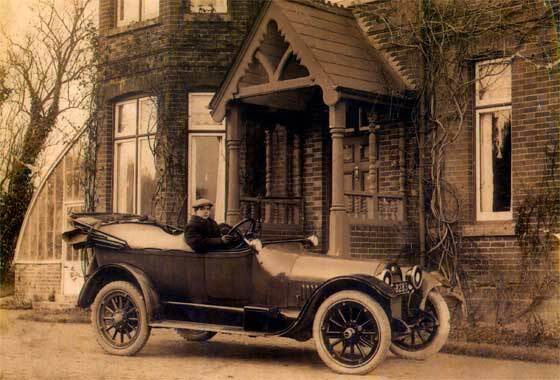 The car in the picture has been confirmed by our Star expert John Warburton as being a cca 1910 Star 12HP. The body is unusual but may have been a factory style. For more info on JFE, click on the photo. Another of a series of photos received from Maggi Wilson (USA). This one is also of a very unusual car registered C6250, so also West Riding of Yorkshire for which no registration records are available. The car, again identified by our Tim Harding, is a cca 1912/14 Vinot et Deguingand which were made in France and originally sold in the UK as La Silencieouse. In France they were later known as simply Vinot. 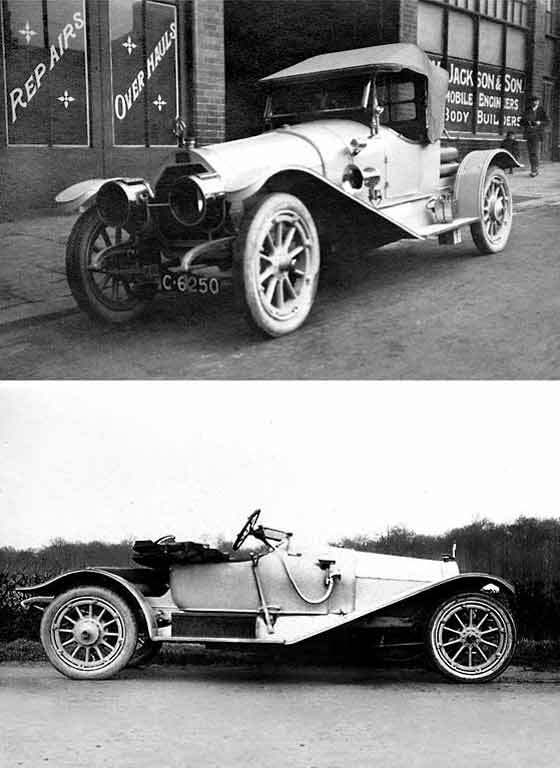 Vinot took over Gladiator in 1909, making both cars. Ceased trading in 1926. Photo received from Gordon Keyte (UK) of his Grandfather who was a chauffer. The photograph was probably taken near Alvechurch, Worcestershire around 1910 to 1920. We can confirm that this is a cca 1912 Rover 12. The photographer was based in Worcester. The Registration appears to have AB 2? ?4, which is a Worcester County Council issue between January 1912 and January 1913. Gramps later worked for Austin and drove to Brooklands with the Austin racing cars. Another of a series of photos received from Maggi Wilson (USA), this one marked Percy Lambert 1913. 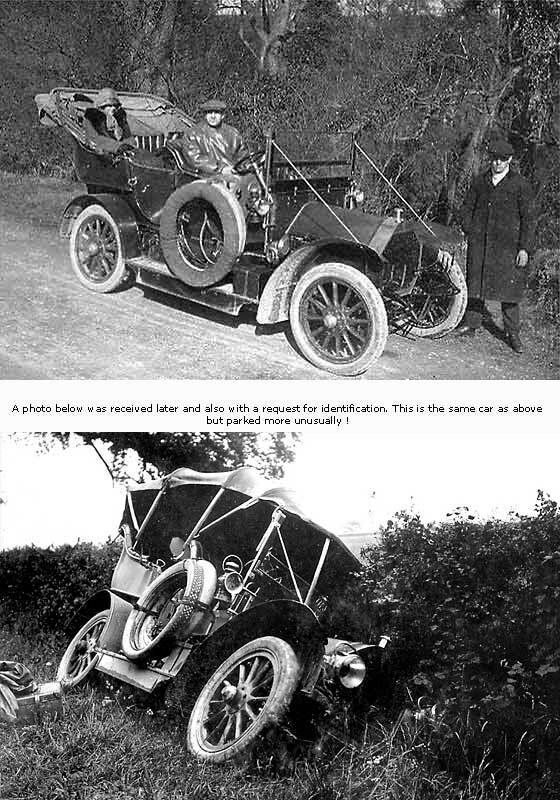 Very interesting photo because this was the famous 1912 25HP 4.5 litre side valve Talbot which, driven by Percy Lambert, was the first car to cover 100 miles in the hour, at Brooklands on Friday 15th February 1913. 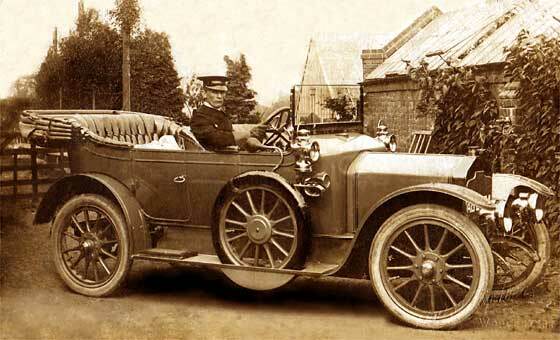 A few months later on 21st October 1913 Percy Lambert was killed trying to regain the record from Peugeot. This photo may have been taken on the second occasion. 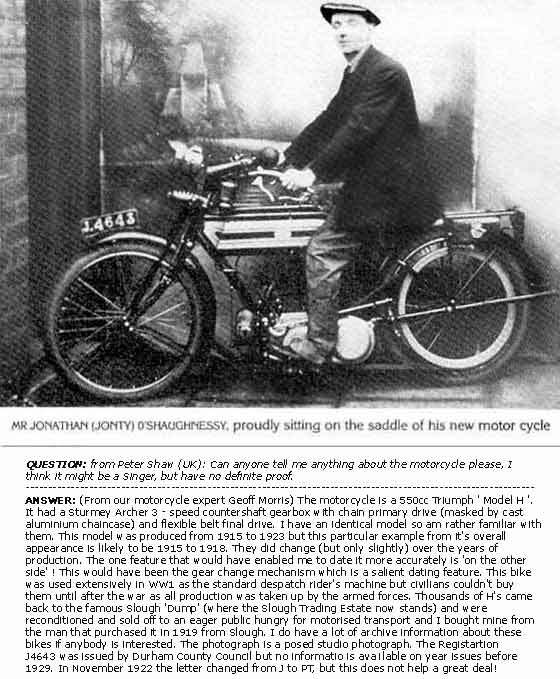 Photo received from Peter Shaw (UK) of a motorcycle which he believed could be a Singer. Our motorbike expert Geoff Morris advises that this is a 1915/18 550cc Triumph ' Model H '. The accurate dating bit is on the other side! This bike was used extensively in WW1 as the standard dispatch rider's machine. Thousands came back to the Slough 'Dump' and were reconditioned and sold to eager public hungry for motorised transport. Regn. J4643 is Durham but no dating records left. Photo from our snapper Tony Oakes (UK) which he received from one of his relations showing their Grandfather, with a request for identification and dating. Tony and I both agree that this is an American Buick, having artillery wheels. I think it is a cca 1917 Buick D34 or D35 because of the flat mudguards. Earlier and later cars had rounded mudguards. Possibly a D45 Six. British numberplate but cannot make out letters. Interesting headlamps, suggesting WW1 blackout masks? Photo received from Carol Jones of Wales (UK) of her great grandfather and family. Aunt thought the car was a Chevrolet. We can confirm that the car is a cca 1922 Chevrolet 490 Touring. Registration FC was issued by the County Borough Council of Oxford in late 1921/22. Chevrolet was already part of General Motors at the time. Most Chevrolets imported into the UK were manufactured at Chevrolet's Canadian plant. Car has not survived. For more info, click on the photo. 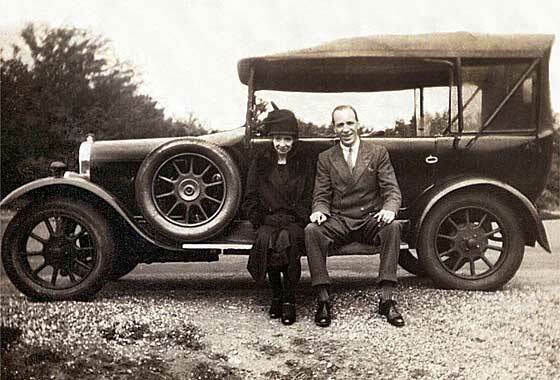 Photo from Chris Stock (UK) of his Grandfather and his Sister sitting on the running board of a car. Gramps was born in 1900 and would be in his mid twenties in the photo. Chris was after an approximate date for genealogical purposes. Due email problems we did not get the photo until recently, by which time Chris had identified the car himself as a cca 1926 Clyno. Well done! A Clyno it is, but we think a little earlier, as it has fewer larger louvers, high headlamps, and also no front brakes. Photo received from Joe Layton (USA) which was given to him by his Father who was trying to help a friend identify the automobile. It has an unusual horizontal louvers on the hood. The picture was taken in Estacada, Oregon, USA. around 1930 or so. 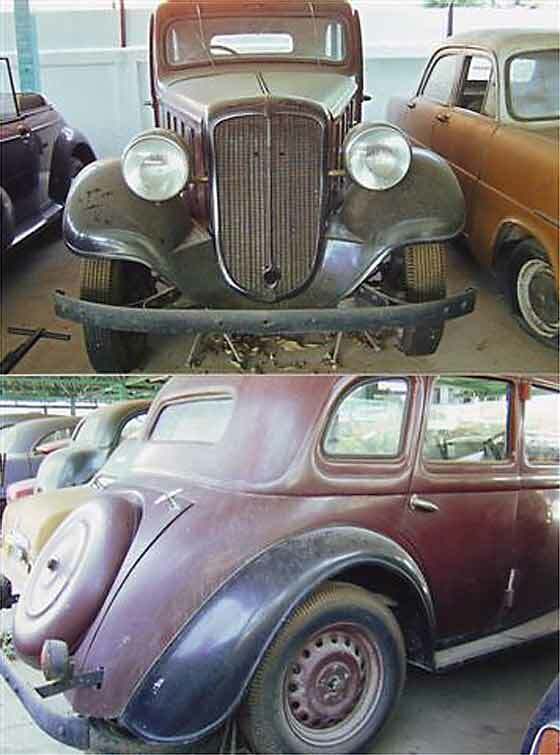 We can advise that it is a cca 1928 Chandler Four Door Sedan. 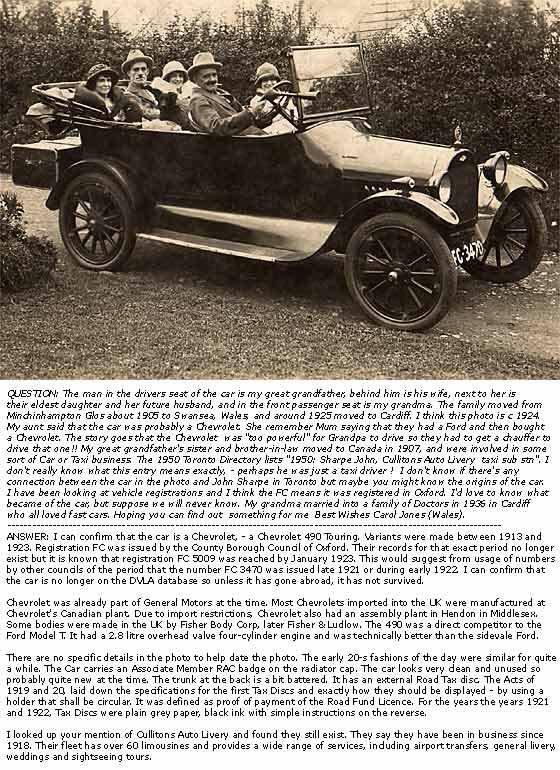 The Chandler Motor Company made cars between 1913 and 1929. 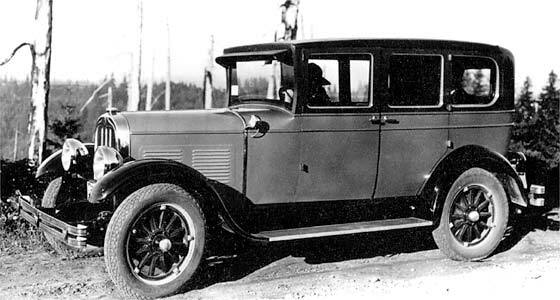 They got into financial difficulties in 1929 and absorbed by Hupmobile. Having a wooden frames, fewer survived. Photo received from John Hunter, Bridgend (UK). His mother and father died when he was quite young, and very recently the only photo was discovered of his mother, sitting in the family car. 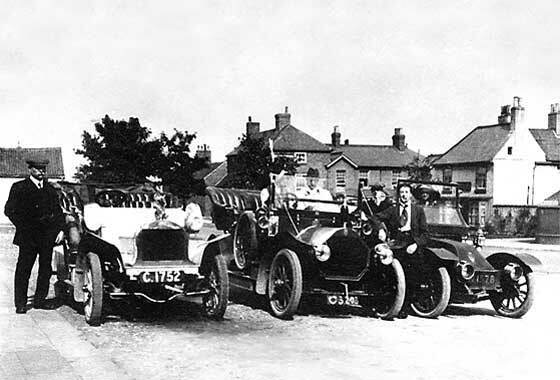 The numberplate appears to read UH 4612 which would have been issued by Cardiff County Borough Council in 1928. 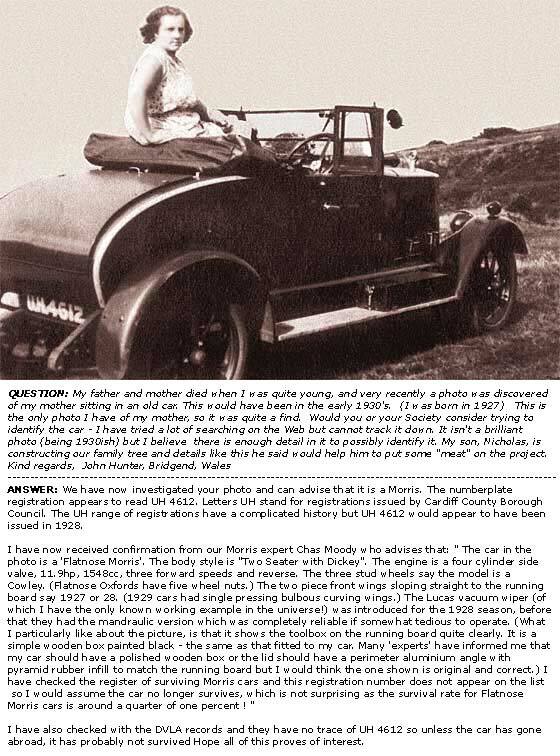 Our Chas Moody identified the car as a 1928 Morris Cowley Two Seater with Dickey, 11.9hp, 1548cc. The car is not on the Morris register or at the DVLA so probably has not survived. Bit like London busses, you never see one, but then two come together! Another photo arrived from Australia sent by Dale Charsley saying he was lucky enough to find a neglected Bedford Ute left outside to rot. It is now stored under cover and ready for restoration. Its body number is 292, the model is ASXC, the chasis number is GLMR RD D8 B8. This is a very similar car to that shown lower down, suggesting part of the same batch. He will need to contact some Bedford specialists for further info. 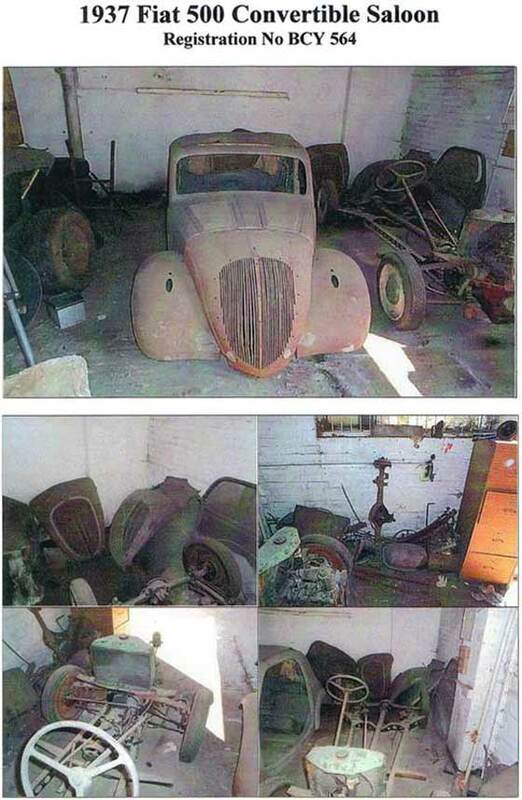 Photos received from Geoff (UK) advising that friends had a 1937 Fiat 500 Convertible Saloon, asking for valuation. The car has been taken to pieces as can be seen from the attached photos and seems in 'barn find' condition. All the bits were there as well as quite a lot of spares also. They were asking about £1,500 for it. Current values (in 2006) were £1k average, £2k good and £6K concours. However, a mint example was available for sale in UK for £8K, and in Ireland recently for €15K (£10K). 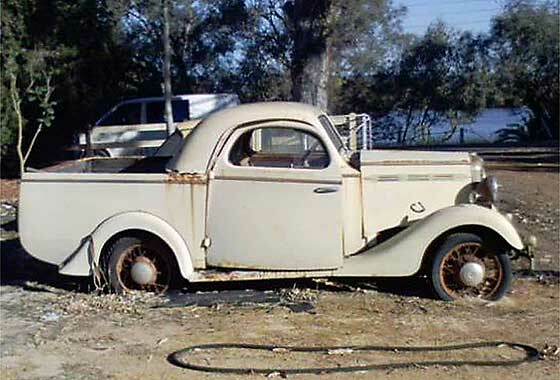 Interesting photo received from Suzanne Taylor (Australia) of a pickup with a request for Dating and Value. 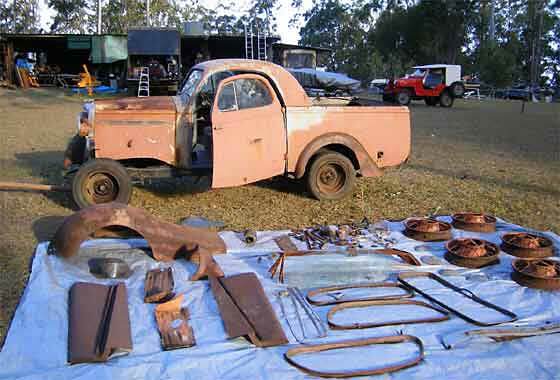 We think it is a Bedford with a Holden type body. There are inconsistencies from both the ASYC and the PC Bedfords so we have to be vague at it being a cca 1935 Bedford Pick-up, generally referred to locally as a "Ute". 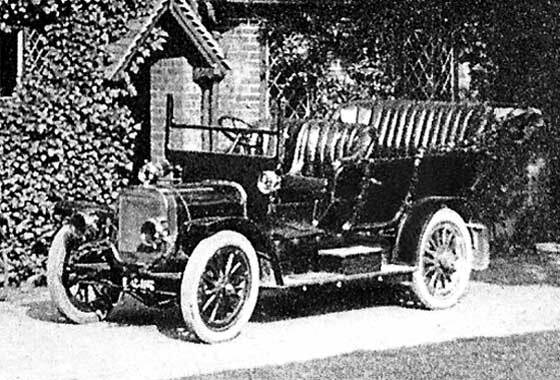 Similar vehicle can be seen on the Restored Classics website. Value in the UK would be low so are asking Webmaster Tubby in Oz to see if he can get any further info. Another photo received from Malcolm Logan from Doisaket, Chiangmai (Thailand). His group of classic enthusiasts has found this car, probably late 1930s era, with original engine claimed running, good body, no rust or crash repairs. Not much known about the underside. Instruments look in good shape. Interested to know the year of manufacture and approximate value. The cars is a cca 1936 Hanomag Rekord. No book values and no such cars currently for sale. Guess at : £1k, £3k and £8K. Photo received from Erik Anderson (USA) of a Tickford Rover with a request for further information and Value. Tickford were well known body manufacturer who put bodies on many makes of cars. 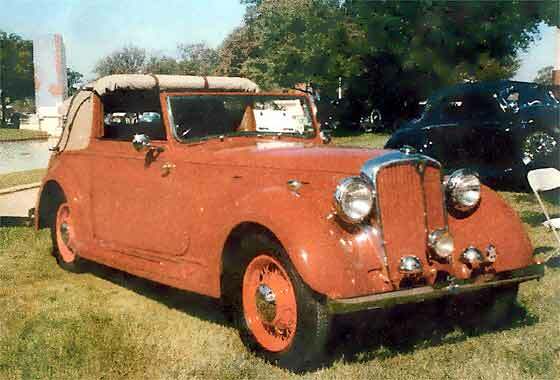 He advises this is a cca 1939 Rover, then as it has wire wheels it is probably a 14. Tickford bodied cars are quite collectable and this one came to the USA through a Christie’s Auction. The value is therefore in the provenance & specialised. Suggest getting an update from Christies for current value. 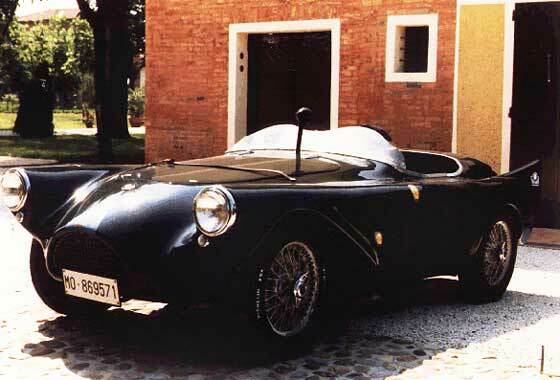 Photo received from Alessandro Lama (Italy) of his car which he believes is a 1954 Lester Riley. Our Riley experts are not aware of Harry Lester having built Riley Based Specials because he is famous for the Lester MGs such as those supplied to the Monkey Stable and raced by Polaroid heir Jim Mayer and his team (click if you want to know more). Possibly a Riley engine, but our Riley chaps think the Riley cassis would have been bit heavy for completion. This is a bit too specialised for us. he information contained in these pages has come from many different sources including books, magazines, advertisements, sales brochures, web sites, manufacturers and personal contacts. While we have tried to make sure that any information given is as accurate as possible, we cannot take responsibility for any errors or omissions. If you know of any facts which are incorrect or any subjects or details which can be elaborated on, please contact us.